We have already noted that HP is literally forced to update its handheld series and replace models, which actually don't need it. 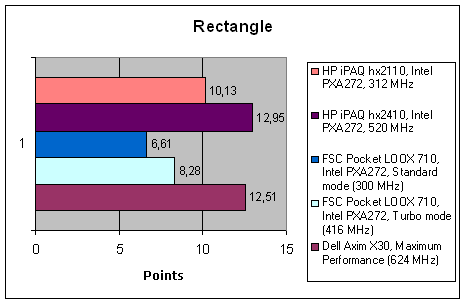 Of course, even very good old iPAQ models can be improved, but the replacement of successful and popular h19xx and h4150 models was not adequate and this evokes some prejudice against new "rearrangements" in the HP series. 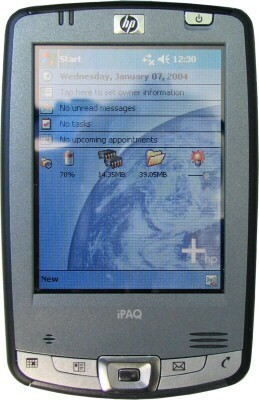 In general, the h2210, though not perfect, became one of the best sellers in the iPAQ product line last year. The two-slot handheld with Bluetooth and good performance did well for fastidious users with an average level of income – middle management, technicians, well-paid students. This model was certainly not without drawbacks, insecure mounting of side inserts above all. The manufacturer decided to add an entire series of similar models to the new iPAQ line, which are ideologically close to the h2210. That is they are designed for technically exigent and corporate users. There are several models for better differentiation so that a user can choose a device with a more appropriate price and features. The series consists of three models: HP iPAQ hx2110, hx2410, and hx2750. The first two models are very close to each other, they have the same exterior and differ only by the processor clock and a set of wireless interfaces. The junior model hx2110 is equipped with a 312 MHz processor and Bluetooth, while the hx2410 contains 520 MHz CPU and a couple of built-in wireless adapters – Bluetooth and Wi-Fi. HP iPAQ hx2110/hx2410 looks quite a usual single-unit handheld of average dimensions for these days. The only unusual feature for a Pocket PC is that this device initially comes with a protective flip cover made of semitransparent plastic, which is attached at the sides in the upper part of the handheld and flips up. This part of the device can be called "semi-thought-out" – this cover is actually convenient to use, but it can be opened only to a certain angle, you cannot bend it around so it is behind the device. At the extreme position, you risk breaking its attachment. The cover is removable, so you can decide whether to use it or not. It all depends on the style and operating conditions of a user. The cover transmits display light well. It acts like a light filter – it softens the image, reduces brightness and contrast, removes sharp pixel borders, so it's convenient to use this cover as a light filter when you read, especially in a dark place. However, there is one inconvenience: the bottom edge of the cover blocks the joystick, which is used to scroll text; so you have to raise the cover a little, to get access to the joystick, which is not very convenient. hx2110/2410 controls are typical of a Pocket PC – four application buttons and a four-way joystick with the built-in OK button. They are placed almost at the very bottom edge of the front panel, the joystick is not very large and rather tight, which is not very convenient and results in some false presses. hx2110/2410 case is equipped with nonslip plastic inserts at the sides, coated with something like rubber by touch. Unlike similar in purpose, insecurely attached inserts in the h2210, the inserts in the new model cover entire sides of the casing, going over the top and bottom ends, and to all appearances they are mounted more securely. Besides, they endure differently distributed pressure, so they shouldn't tear away as easily as in the previous model. The left side houses a voice recorder button. There is a special hole for this button cut through the side insert, the button itself has the same nonslip surface. The top face houses CF and SD/MMC expansion slots covered with caps and an infrared port. On the bottom of the device there is a connector for a data cable. The bundle of the hx2110 includes the handheld itself, a charger, a data cable with a charger connector, power adapter to connect the charger directly to the handheld, documentation and a CD with standard Pocket PC software. The hx2410 comes shipped with a cradle instead of a data cable, with a stationary USB cable. Cables for the hx2110 have a typical for junior iPAQ models configuration. There is no cradle in the bundle, an USB data cable is used to connect the handheld with a computer. There is a tap near the handheld plug to connect a charger, if you want to synchronize data and charge the battery at the same time. There is no special connector for a charger in the handheld. If you want to charge it without a data cable, you can use a special charger adapter, which allows to plug it to the data connector. The cradle in the hx2410 is compact and light-weight, it's equipped with a charger connector. Cradle guides allow nice and easy handheld installation right on the data connector, so it's very convenient to use. Stylus in the hx2110/2410 is plastic, solid, of an average size and weight, circular with mat surface, which contributes to a better grip. If you like small styluses, you will like it. Display of this handheld is a 320x240 TFT matrix supporting 65 536 colors. It's a bright, contrasty, and sharp display, which renders live and saturated colors. It better than the h2210 display by these parameters, the cold gamma also contributes to a favourable impression (the gamma of the previous model tended to warmer colors). However the new model has narrower angles of vision, contrast and color balance start to change already at the 45-50° horizontal tilt (relative to the regular handheld grip). This can be explained in two ways: on the one hand, it offers better confidentiality, it's harder to steal an outside look; on the other hand, it's less convenient to work with. The hx2110 is equipped with a 920 mAh Lithium-Ion battery, and the hx2410 has a 1440 mAh Lithium-Ion battery. It's installed into a pocket at the back of the case. Battery dimensions as well as its connectors are rather large, they could have made a battery of a much higher capacity in this form factor. The battery bay is secured with a flat metal-coated cover, which is fixed by lugs on top and by a button-latch on the bottom. It may prove difficult for a novice at first, but later on users open and close it without any problems. 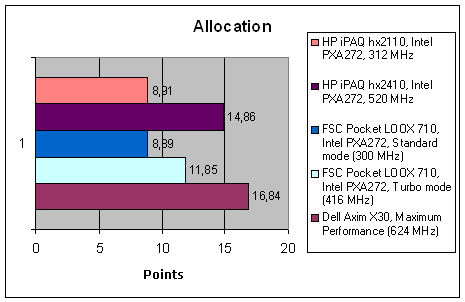 The hx2110 has the following hardware configuration. 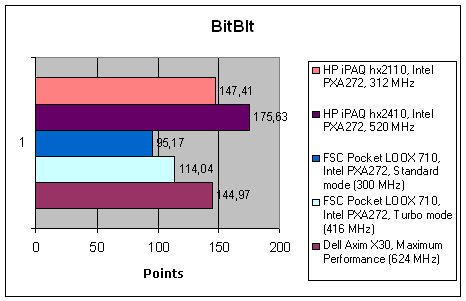 The system is based on Intel PXA272 312 MHz, it's equipped with 64 MB RAM and 64 MB Flash ROM. The Flash ROM has an allocated 22.06 MB area to store user data. The handheld is equipped with two expansion slots – Compact Flash Type II and SD/MMC, both support not only memory cards but peripheral devices as well. There are USB and wireless interfaces (IrDA and Bluetooth) to connect to other devices. HP iPAQ hx2410 is equipped with 520 MHz PXA272 processor, it also carries 64 MB of RAM and 64 MB of flash memory, capacity of the "built-in flash drive" is also 22.06 MB. It also has two slots (CF Type II and SD/MMC), PC connection via USB. But besides IrDA, it has two wireless adapters – Bluetooth and Wi-Fi. As you can see, equipment of the junior model can be called neither too rich nor too scarce. System electronics is average for these days: The 312 MHz processor is as good as low end, Pocket PCs are not equipped with lower clocked modifications of the latest XScale chips. Memory capacity is average for these days, the set of interfaces becomes typical of medium-priced handhelds. On the other hand, two expansion slots are rather rare and indicative of more expensive handhelds. So, the new model lays stress on expansibility. The hx2410 differs by a faster processor and an additional Wi-Fi adapter. It's equipped like middle end, except for a processor. A 416 MHz chip would have been a standard solution, but HP decided differently, having ensured additional performance reserve for its model. Top 624 MHz PXA272 processor has been reserved for the senior model, and the hx2410 should embody an optimal balance between the price and the performance. In order to satisfy the increased power requirements of the processor, it was decided to use a battery of a higher capacity. HP iPAQ hx2110 and hx2410 operate under MS Windows Mobile 2003 Second Edition. The set of preinstalled software is typical for a handheld of this brand – there are several additional HP programs besides utilities included into the OS bundle. The main screen in the hx2110/hx2410 contains several additional controls: brightness control, free memory report and a shortcut to the sweep applet, a battery charge indicator. The same functions can be obtained using third-party programs on any handheld, but here all corresponding applications are fortunately installed by default. HP Image Zone – a program to view images, which interface is similar to the standard image viewer in Windows XP. Like its Windows counterpart, Image Zone displays a reel with framed images in a selected folder, a selected image is displayed enlarged. There is an option to view it in a separate window, full screen, zoomed. The program allows to perform simple operations over graphics files – view histogram of the current picture, rotate it, add comments, move to a selected folder, and organize slide shows, send a picture by e-mail or IrDA, or print it using HP Mobile Printing or HP Instant Share Printing. HP Mobile Printing is a utility that controls the corresponding service. It uses a wireless printer connection via IrDA or Bluetooth. Of course, the printer must be equipped with a corresponding adapter and software support. iPAQ Backup is a program to archive important data. The program uses SD or MMC cards as a backup medium, you can store the contents of My Documents folder, e-mail database, address book, and system data. iTask is a utility to manage applications and main handheld functions – screen and backlight, wireless interfaces. This utility also allows to switch between screen orientations – this function appeared in Windows Mobile 2003 SE and it's hidden within the jungle of Settings menu, so the iTask utility is a good way to get access to this option. The hx2110/hx2410 settings include several brand iPAQ options and features. The new series supports battery charging from USB, this option can be enabled in settings. Processor clock cannot be controlled, but you can fine-tune backlight – 21 brightness levels for battery and external power operation. 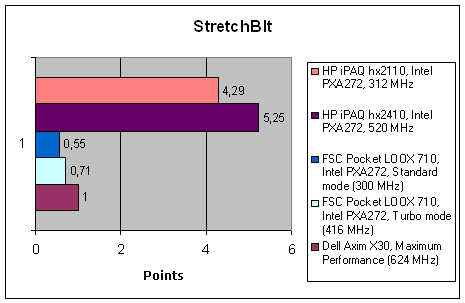 Theoretically, HP iPAQ hx2110 should not be anything extraordinary, as its CPU clock is rather moderate. 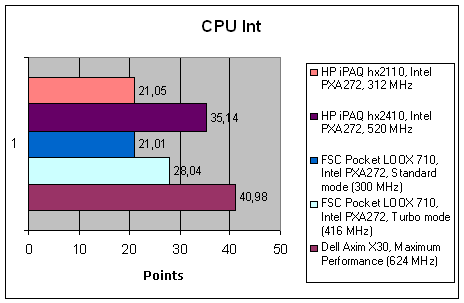 The increased processor clock in the hx2410 raises some hopes, however the same price range also offers Dell Axim X30, where this parameter is higher and reaches 624 MHz. Indeed, both new models demonstrate nothing extraordinary in processor tests, their results are strictly proportional to their CPU clocks. But in practice, overall performance of a Pocket PC is rarely determined by a processor alone. Indeed, both the hx2110 and the hx2410 demonstrate impressive results in graphics. It can be partially explained by a different implementation of the memory system. Both models demonstrate very good results in the fill test, though they differ from their competitors only by 0.1 point (note the scale and the reference point in the corresponding graph). The high quality of memory has a positive effect on results in video buffer fill tests, but I repeat: they are nothing but very good. But scaling graphics objects (StretchBlt test) is performed at the 4-to-1 performance advantage – this result can be provided only by a video accelerator, though specifications on this model hold back this information. As a result, by overall performance HP iPAQ hx2110 outscores practically all middle end handhelds, which are equipped with 400 MHz processors as a rule. 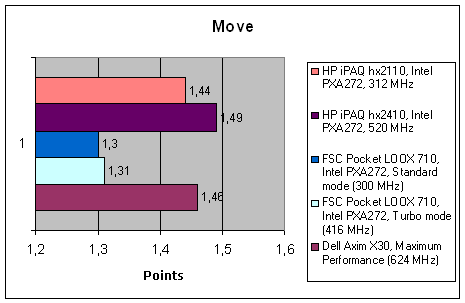 In this case the platform "pulls up" a rather slow processor, which was typical of iPAQ h19xx, for example. 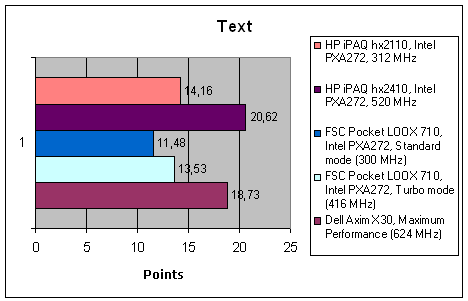 The middle model (hx2410) outscores even the recent leader (Dell Axim X30) and becomes the fastest Pocket PC to date. What concerns battery life, the hx2110 demonstrated 3 hours 35 minutes in the Spb Benchmark Battery Test, Max Backlight, Standard Using, backlight set to maximum brightness – this result is fairly average. It's the "fault" of the battery, which is not too capacious – 920 mAh is not enough for these days. The hx2410 demonstrates much better results in the same mode – 5 hours 48 minutes. That doesn't break any records, but it's still very good. As you can see, increased battery capacity was quite enough to compensate for increased power consumption of a faster processor. Moreover, it allowed much better battery life results. These tests were carried out at maximum brightness, which is rarely used in everyday life. According to previous tests, when you switch from maximum to minimum brightness in this test, battery life grows approximately twice as large. Thus, the hx2110 can operate approximately 7 hours at low brightness level and office operations. The hx2410 – 10-12 hours. HP iPAQ hx2110 and hx2410 represent a class of two-slot middle end handhelds, which is rather rare these days. Theoretically, such models must combine expansibility, sufficient performance for advanced users, and a moderate price. That's what the h2210 used to be, a very popular predecessor of this series. Both handhelds are very successful solutions from the technical point of view. Excellent platform ensures high system performance, processor clock control (this feature is one of the key indicators of handheld class) allows to obtain higher performance than in other models with similar CPUs. The manufacturer plans to oppose the hx2110 to low-middle-end handhelds, equipped with Bluetooth-adapters, the hx2410 – to two-interface middle-end models. In both cases two expansion slots should serve as an additional advantage – it's a rare feature in non-top Pocket PCs, which provides compatibility with a wider range of accessories, allows to use cheaper CF cards, and to use simultaneously removable memory and a peripheral device. Additional advantages: nonslip tightly attached inserts, semitransparent cover, which can be used as a light filter (though its construction is not very good). The most critical drawback of the handheld is a small, tight, and badly placed joystick. Without other scrolling controls it's a very serious inconvenience for reading e-books. Some users may find a display with not very wide angles of view insufficiently good, but that's rather subjective. Now what concerns prices. You can buy HP iPAQ hx2110 in Moscow approximately for $320, prices for the hx2410 start approximately from $420. These figures are quite acceptable, I guess. Of course, the hx2110 is a tad more expensive than the h2210, which provokes indignation at first, especially considering the low clock speed of its processor. But this difference is not very large. 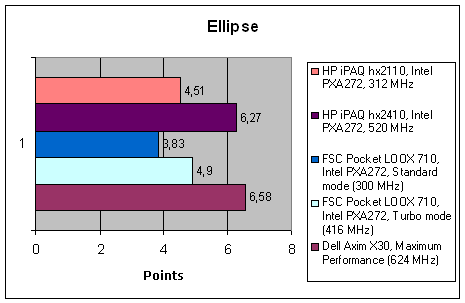 Besides, the h2210 is rapidly going out of sales, and there is no other Pocket PC offering a better price/feature combination, so the hx2110 price has to be considered optimal ipso facto. What concerns the hx2410, the price for this model is quite typical of a two-interface handheld. The only problem is a noticeable price spread for the new iPAQ models across various regions. The hx2110 costs $320 in Moscow, but in Kiev its minimal price is about $400, which is definitely too much, considering the low processor clock, and the hx2410 costs about $500 in Ukraine. 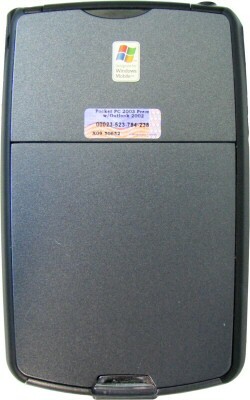 The main competitor to both new iPAQ models is Fujitsu Siemens Pocket LOOX 710 – the closest in bundle and positioning. Judging from specifications, Dell Axim X50 (QVGA modification) will also compete with our iPAQs. Though the alignment of forces here will be clear only after an examination of this model. Axim X30 624 MHz is also in the same price range. So the choice is rather wide. 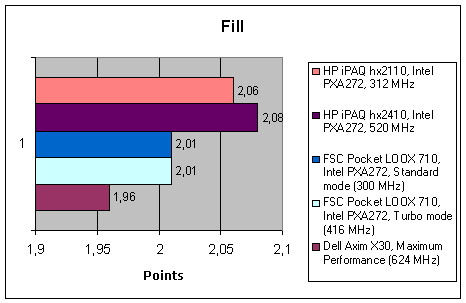 Pocket LOOX 710 happens to be heavily outscored by both iPAQs. 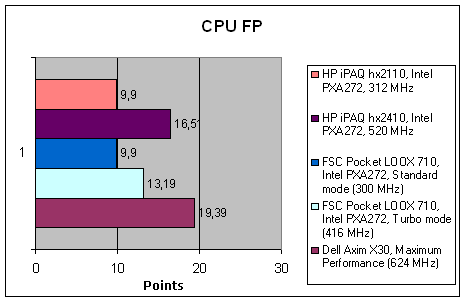 The junior model is faster than its competitor from FSC, even though its processor is slower. Besides it's noticeably cheaper (due to no Wi-Fi). Pocket LOOX 710 and HP iPAQ hx2410 are closer to each other. The HP product demonstrates overwhelming superiority in performance, it's equipped approximately in the same manner, and it's even a tad cheaper ($420 against almost $440 for FSC 710). The only advantage of the FSC handheld is its built-in USB host. Dell Axim X30 turns out a tad slower than the hx2410 as well (it was even hard to fancy that, considering how fast its CPU is). Besides it's equipped with one expansion slot only, so in this case the HP product is more preferable. In general, if you look closer, the new HP models turn out very good products at optimal prices. We can only wish the prices in regions to level down, they are sometimes too high.